CENTER STAGE CHILDREN’S THEATER SUMMER CAMPS! 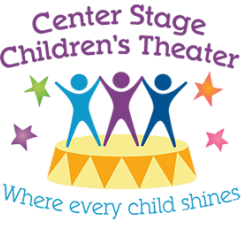 Summer fun is right around the corner with Center Stage Children’s Theater (CSCT). CSCT is a safe, fun and unique theater camp experience “where every child shines." Each one week session features four daily classes in acting, singing/music, dance, and art lead by professional teaching artists. CSCT is a safe, fun and unique theater camp experience. The supportive environment provides exposure to the performing arts while helping students build confidence in their own abilities and imagination. The camps culminate with a mini showcase performance on the last day of the session at 3:00 p.m . All campers will have the opportunity to perform for family and friends, featuring a variety of songs, dances and improv. The camper’s first half of the day will be filled with exercises that activate their bodies, voices, minds and imaginations. After lunch, campers will play fun outdoor games, followed by a fun daily craft. Refunds are considered on a case by case basis. If your reason for refund is approved, a $25 cancellation fee will apply. An additional prorated amount will apply if the child attended any days of camp. Lunch and Snacks: A full day of the arts requires a lot of energy. We recommend packing your child a full lunch (that does not need to be microwaved) and two snacks. Attire: Children should be dressed to move and be comfortable moving. Please no flip flops or shoes with wheels on the bottom; athletic shoes are great. There will be a sign-In/Sign-out sheet that must be signed each day when dropping off and picking up your camper. Please be on time for pick up. Early drop off: 8:00 a.m.- 9:00 a.m. - Early drop off available at no additional charge. *Friday, the last day of camp, we will have a short performance showcasing what we have learned from the week. The performance will take place at 3:00pm. Parents, friends and family are invited. Lunch: Please provide your child with a cold bagged/sack lunch. We will be eating lunch in the park most days. No microwave lunches please! Snack: Please provide your child with a snack in addition to their lunch. Attire: Children should be dressed to move and be comfortable moving. Please no flip flops or shoes with wheels on the bottom; athletic shoes are great! T-Shirts: Each camper will receive a summer camp t-shirt (included in the cost of tuition). The shirts will be left at CSCT for the duration of camp, they will be able to take it home on the last day of camp. Campers should arrive to camp in regular clothes, but they will be required to put their camp shirts on over their clothes before we leave for the park. We will give campers time to change if they prefer not to wear the t-shirt over other clothes (we don't want them to get too hot or uncomfortable). It is important that all of our campers wear their CSCT camp shirt for safety, identification and unity as a group. Sunscreen: We plan on spending time outdoors, so please be sure to apply sunscreen before arriving to camp each day. CSCT will have sunscreen on hand, but you must sign the sunscreen application wavier in order for CSCT staff to apply sunscreen to your child. You may also supply your own sunscreen for your child.